At the moment, I have been really into “KIRIGAMI”! 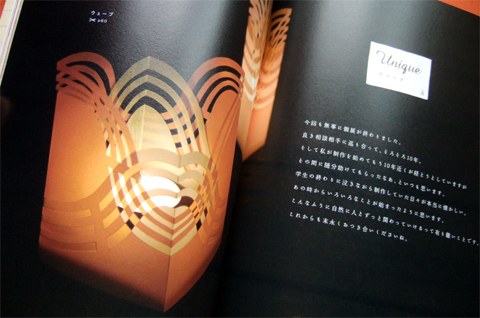 It is a paper motif made up by folding, cutting and then reopening a piece of paper. Kanako Yaguchi has published several “KIRIGAMI” books, and among them, I love the “OTONA NO KIRIGAMI NO HON”(ISBN 4569692354) most. There is a website that lets you make a “KIRIGAMI” online, too. This is for the Japanese style. “MON” is Japanese traditional patterns often used for “FUROSHIKI” or “wagashi”, and these “MONs” can also be made by “KIRIGAMI”. How about putting the “MON” you made on a card or a coaster? 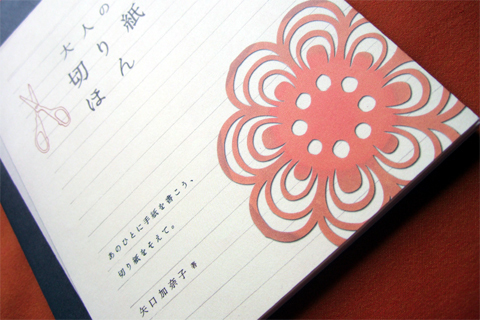 Or using a fabric “KIRIGAMI” for an appliqu?, which would be cute, too!